Another essential iPhone app has popped up. Once there was a time that a certain website that shall remain nameless used to have a database that would tell you how many times you'd heard a certain song live. That database had gone away, but BJH studios has resurrected it in the form of a free iPhone app, The Unofficial Pearl Jam Stat Tracker. Just check the shows you've been to and let the fun begin. 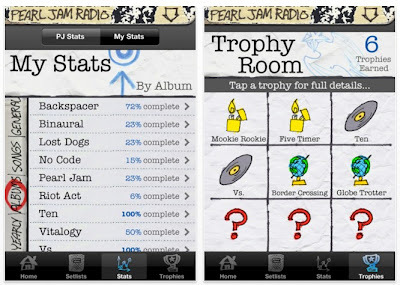 The unofficial Pearl Jam Stat Tracker is an interactive app featuring a comprehensive database of the show setlists Pearl Jam has played in their rich 20-year history. You can browse setlists by date or location, and select which shows you attended. In the Stats section you will find detailed lists of Pearl Jam's concert statistics organized by individual songs, albums, and years. You can also view your personal statistics from the shows you've selected. Based on the shows you've seen, you will be awarded trophies for reaching certain concert milestones (for example, seeing all of Ten live)! You can view these trophies in the Trophy Room. 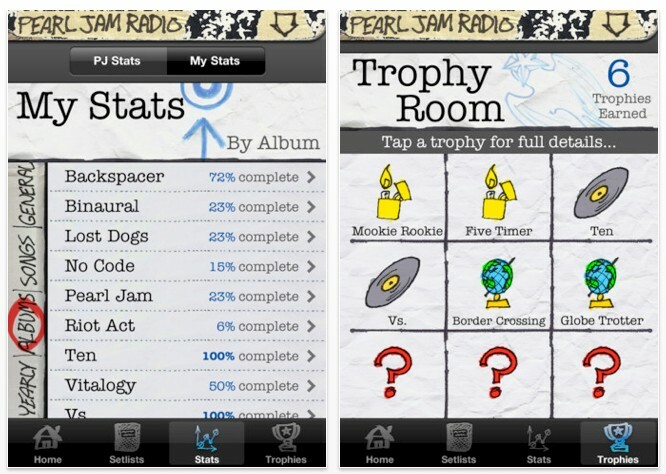 Best of all, Pearl Jam Stat Tracker gives you easy access to the Pearl Jam Radio stream from pearljam.com. Now you can listen to Pearl jam wherever you go! The Soundtrack Game is On! PJ20, There's an App for That!